Our workshops are lively, inclusive and instructional for students of all ages, teachers and adults. Red Sky offers lively, inclusive and instructional workshops that introduce children, youth and adults to the world of theatre, dance, music and voice. Each workshop is one and a half hours in length, and is responsive to the interests of the participants. 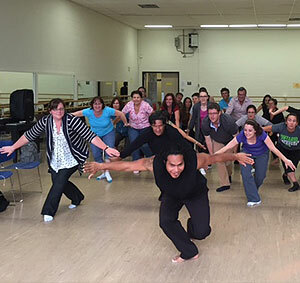 Workshops are participatory and intended to get people on their feet and having fun with movement, voice and music while introducing elements of First Nations culture. We have a lot of flexibility and can tailor the workshop to meet your needs. We have held workshops in public schools, high schools, universities and colleges, community centres, theatre venues and festivals across Canada and overseas. Ideal for elementary school students, as well as drama teachers, parents and adults. Please call 416-585-9969 or email info@redskyperformance.com if you would like to book a workshop in your community, school or venue.